Set of 6 decorative solar lights ideal for pathways, driveways and gardens. Stainless steel, with an.. Solar Light String - Amalia Blk 20 ct.
177"L x 1.25"W x 2"H. Ideal for decorating shrubs, umbrellas, doorways, pergolas, tre.. Solar Light String - Bente Blk 20 ct.
177"L x 1.75"W x 1.75"H. Ideal for decorating shrubs, umbrellas, doorways, pergolas, .. Solar Light String - Cornelius Pewter 20 ct.
177"L x 1.50"W x 2.50"H. Ideal for decorating shrubs, umbrellas, doorways, pergolas, .. Ideal for decorating shrubs, parasols, and doorways Powered by a separate amorphous solar panel..
177"L x 1.60"W x 1.75"H Light cage 1.60"D Bulb diameter 0.75" Idea..
177"L x 1.25"W x 3.50"H Ideal for decorating shrubs, umbrellas, doorways, pergol.. Solar Magic Globe 8" Dia. Magic Globe Solar Light - 8" diameter Overview8" Diameter glo.. 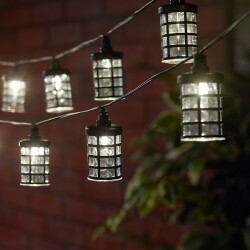 Decorative lighting ideal for your garden. This decorative solar rock light blends into the landscap..